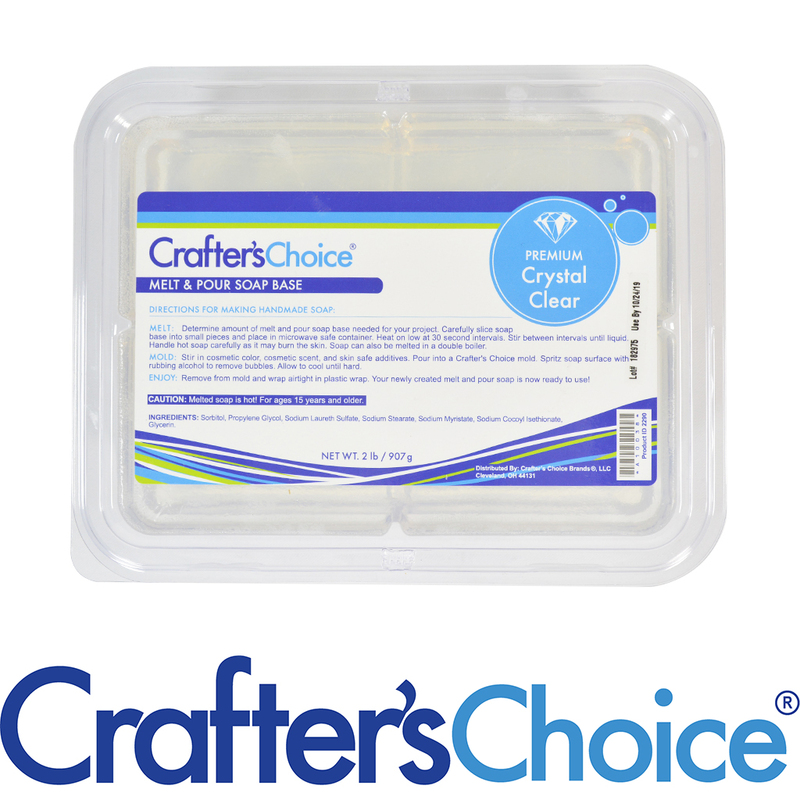 Our Crystal Clear Melt and Pour Soap Base is the clearest soap on the market with a clarity score of 10 out of 10. It is perfect for embed paper and creating designs where clarity is vital. The two-pound tray is the perfect size container for projects making (8) 4 oz. bars of soap. The lid allows for unused soap to easily be stored for future use. COMMENTS: SO CLEAR!! Its amazing! 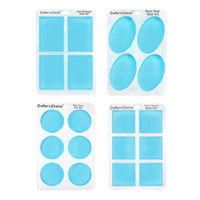 COMMENTS: I use this for personalize soap favors with water soluble paper & it works wonderfully! Clear as glass and does an excellent job! COMMENTS: Perfect clear soap base. Exactly what I needed it for. COMMENTS: Couldn't believe it! I used this with printed pictures to make custom soaps. There was no cloudiness, it was amazing. I will be ordering more! It also lathers wonderfully! COMMENTS: This works very well to make clear melt and pour. Heat carefully. COMMENTS: Showed off my embeds perfectly. Wonderful lather. Will purchase again. COMMENTS: This soap base was used for embed soap designs and it performed very well. I try to limit using it because I prefer detergent free bases but you cannot beat this base when your goal is clarity. "The clearest melt and pour base"
COMMENTS: So happy I found this clear melt and pour sosp base. It really is the clearest I have been able to find. Doesn’t fog up. And great lather. It’s perfect for embeds too. COMMENTS: This soap base is great. 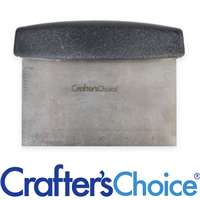 It leathers very well and works great for all of my melt and pour needs. COMMENTS: Awesome melt and pour base. "My go to for melt and pour soap"
COMMENTS: My go to for melt and pour soap.Great product. COMMENTS: High quality and very clear. Great for embedded toy soaps for kids! COMMENTS: I love keeping this product around for quick, easy add-ons to my CP soaps. Very handy! Melts wonderfully and holds color well. Thanks! COMMENTS: I thought this was pretty good.iI primarily used this to make ice cubes and they looked good. Although, I can’t say i see a huge difference between this and a regular clear soap from another company. COMMENTS: I use this for embedding dissolvable paper in MP and embeds for my CP soap. Works great for the paper as it is extremely clear. COMMENTS: This base is a must have for embedding objects in melt and pour. I love the clarity of this base and it is easy to work with. One of my soap kitchen staples! COMMENTS: Easy to use, almost as clear as water with low sweating. This is my go-to MP soap base. COMMENTS: Really a great soap base. Really crystal clear. Worked perfect for my projects. "Great results by working fast paced"
COMMENTS: I really like to use this to make designs on the top of my soaps, but I have to say you have to work fast with it since it dries super quick for me, but im guessing its because my place gets kinda chilly. Be very cautious, since it can get really hot. COMMENTS: Can't wait to try some melt & pour techniques. Looks pretty clear to me. COMMENTS: This soap lathers up so nicely! Definitely recommend! COMMENTS: I recently made a MP soap using the Crafter's Choice Crystal Clear Soap Base that I called "Surf's Up". I love the clear base soap and after adding variations of colors, my waves looked absolutely perfect!!! This soap is one of my top sellers and one that has received the most attention on my social media platforms. Thank you for a great product. COMMENTS: Easy size to work with. COMMENTS: This is a very clear MP Base. Very mild. Will purchase again. COMMENTS: Worked perfect for my planned project! "Premium Crystal Clear MP soap base"
COMMENTS: This is another of my "go to" MP soap bases. Love how it holds color. Nice silky lather. Will continue to buy this MP soap base. COMMENTS: Love buying my melt and pour for embeds from here. Quality products and prices. COMMENTS: This is exactly what I was looking for! It takes color well, lathers well, and is easy to use. COMMENTS: This base is the best! It works well with added oils & holds the fragrance well. I love using glitter micas in this base because it shines perfectly! COMMENTS: crystal clear, very easy to work with, makes perfect ice cube embeds! "Like how clear it is." COMMENTS: I like that this melt and pour is really clear and that its really bubbly. COMMENTS: I love this product. It's easy to work with and allows for a easy coloring without a yellow hue. "Colors work beautiful with this soap!" COMMENTS: Beautiful clarity in this soap base. It has been super humid where I live and make soap in all fairness... and the soap is still kind of sticky after a week. But, I would buy this again. COMMENTS: I use clear frequently & have run into bad ones! This is great, worth stocking up on! COMMENTS: It made clear color that when you held the soap to light it glow like color crystal jems. COMMENTS: OMG! MY ONLY MISTAKE IS NOT BUYING MORE WHILE ON SALE. MY CLIENTS LOVE THE KIDS FISH SOAP AND THE OTHER CREATIONS i HAVE MADE WITH THIS SOAP.i ALSO LIKE HOW THE STAIN GLASS COLORS LOOK WITH THIS BABY! COMMENTS: this base is as clear as can be and I love it, definitely will be buying more! COMMENTS: This has been by for the best Crystal Soap I've ever used! I can't wait to see how the photo soaps are going to look when I use it. This is now my new clear soap I'm keeping in stock. COMMENTS: Super easy product to use. Love it! COMMENTS: Melts easily. Used it for soap balls on top of my CP. never any sweating issues. COMMENTS: This base is one of my favorites. It sets up nicely, no surprises. Very clear. Holds color well, whether liquid color or the color bars. I can finally make black soap! I love it, and my customers do too. I would purchase again! COMMENTS: This soap melts beautifully and is amazingly clear. Glad I won't have to "blue" clear soaps anymore. COMMENTS: This soap suspends items in soaps and is soo easy to use. It is almost foolproof... I enjoy working with it. COMMENTS: Excellent base! Will continue to use in the future! COMMENTS: I use this in the a sugar scrub recipe and it turns out perfect every time. When I ran out I tried to substitute with a glycerin melt and pour from a craft chain store and the consistency was not the same. COMMENTS: Great base to work with. Very clear. COMMENTS: The clarity of this soap is beautiful! Lathers beautifully and doesn't leave my skin dry. It is also a great addition to my whipped soap recipe. COMMENTS: I love clear bases. It makes colors look bright and sharp. COMMENTS: I purchased the Crystal clear melt and pour soap base to make a color block soap, and I love it. It was so clear, and the clarity allowed my colors to really pop and stand out. I love this base and can't wait to use it for other projects that I have in mind. 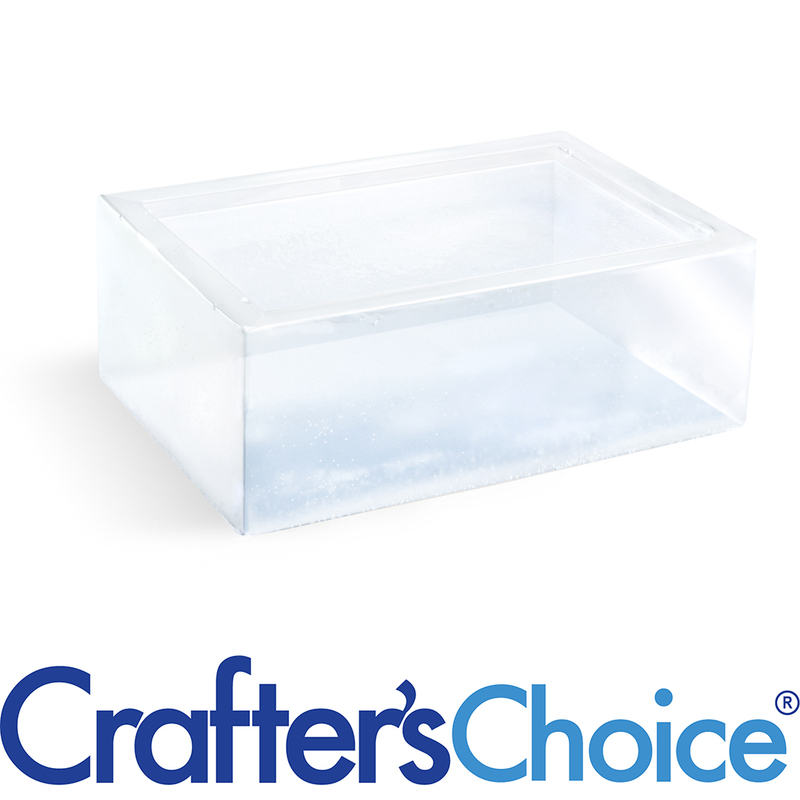 "Loved this in Making my soaps with Water soulable "
COMMENTS: I live this base so easy to use. I used the whole two pound block in two days and I need to get more. The people love the soaps with the toys and scenes I have made. The clearest clear I have used. COMMENTS: it melted well and poured well. Used it to make luffa soap. Luffa shows up nicely through it. Didnt sweat. COMMENTS: This clear base is my favorite base to use, it makes my loofah and stained glass designs really POP! COMMENTS: Great base! It's definitely clear, not cloudy. Nice bubbles. Lathers very well. • Does not dry skin out. COMMENTS: this soap is easy to work with. I got it in the vanilla sugar scrub kit and I reordered it to make more. I recommend! "Very clear and great medium for glitter accents"
COMMENTS: I love having the ability to add glittered accents to my soaps! This also makes the colors vibrant. It keeps your skin soft and silky. COMMENTS: I will use this again. very clear. "Love this melt n pour "
COMMENTS: A must have base,! So many recipes to use this with!! Looks and works great with luffa kits and lolly pop soaps for Christmas sales and gifts! • Must always have. Very bubbly. "Clear melt and pour base"
COMMENTS: I like this base it works great for my & year old. It is great for embeds. My friends like this base saying it leaves a clean feel after bathing. My male friends and family like this product with out adding fragrance it doesn't have a smell like other bases. COMMENTS: I bought this to have on hand to use for embeds instead of the usual Olive oil and aloe soap I use. The colors really pop in this clear base! I like it a lot! COMMENTS: My customers love this soap easy to work with. COMMENTS: Family and friends love the embedded soaps I made with this base. Colors I added were just gorgeous! Will definitely be ordering more of it very soon! COMMENTS: This is my go to base when I need clarity in my soap designs! It's so perfect and clear! COMMENTS: I love this soap. I have purchased this soap many times and it always surprises me how well it takes color and scent. It is easy to work with and well worth the money. It has definitely become my "go to" soap. COMMENTS: New to soaping, so this melt and pour base is super fun and easy to work with. Excellent clarity! COMMENTS: I use this to embed the soluble paper with graphic soaps. Works well, very clear. "Super product, easy to use"
COMMENTS: I've used this product twice now - for fish in a bag soaps, and rainbow layered loaf bars. It's extremely easy to use, takes color well and I have not had any problems with beading/sweating. COMMENTS: This base is so clear, it is perfect for window soaps and Imbeds. It also produces great lather and smooth skin when used. It is my favorite glycerin base. 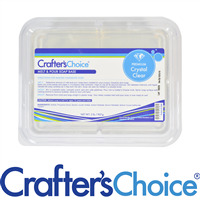 "Crafters Choice™ Signature Crystal Clear Soap Base"
COMMENTS: This was my first time using a soap kit and absolutely LOVED how simple this product was to use. It was a very easy and clean melt. Was a breeze to work with! COMMENTS: I didn't know a clear base could produce such amazing results. I used it for the first time with the Nicole rose loaf mold and the results were incredible! My soaps look like stained glass works of art! COMMENTS: Love this product! Very clear and low sweat. COMMENTS: This one is a must if you need clarity. I used in my fish in a bag soaps and had no issues with cloudiness. it really looked like water. COMMENTS: Before I used Crystal Clear MP,I was convinced that clear MP soap was clear. However, this soap is really clear. When I placed the embeds in the soap, it was so fun to see the clarity of the embeds. Also, my prints come out so clear. My customers love this soap including the great lather. 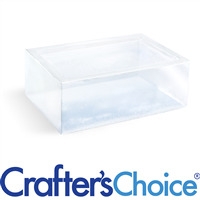 "Signature Crystal Clear Soap Base - 2 lb Tray"
COMMENTS: Love WPS Soaps! I have used them all! I have made dozens of different products! From soap to bath crayons. WPS Soaps perform well under all conditions. It doesn't matter if you buy 2lbs or 24ibs, the quality is the same. I only buy WPS Soaps. 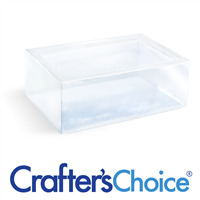 COMMENTS: I make cold process soap and I use this and other clear bases for embeds! Just add a touch of mica and pour into your mold and they look gorgeous. Melts easily, doesn't dent or sweat. I have had extra stored for months and they are fine as the day I made them. "Amazing for 2 type soaps!" COMMENTS: I use this base for the clear layer of my signature image soaps, and the picture embedded always looks amazing! This is always my first choice for making transparent soaps. 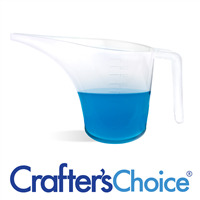 "Clarity of this Base is Extraordinary "
COMMENTS: Great Product! I use this base mainly for embeds that I want to be totally crisp and clear, and this base is exactly that! It's also a great choice of product for those clear bars with detailed embeds. COMMENTS: Again, just as I posted about the 2 lb trays of ultra white, I find the trays to be so convenient and easier than cutting from the large block! "Great clear base for embeds"
COMMENTS: I am always a tiny bit disappointed in the clarity of clear bases with my M&P projects. I do hand cut detailed monogram embeds and clarity will make or break the entire project. This base worked well, though I still wish I could find an absolute CLEAR (like, invisible!) base for this project. Perhaps my expectations are unrealistic. This is GREAT for standard embeds, kids soaps, ice cube embeds, etc. I am still searching for something on another level of clarity for my wedding monogrammed soap favored. I will continue to purchase this product. COMMENTS: Excellent base and very clear. "What does this question mean??" COMMENTS: As a newbie I had some m&p from somewhere else first and it was wet through the whole time. Always water sitting on it in little droplets. It made me decide not to do m&p and I changed to cold process instead. However, there are many times ive found that m&p is needed, embeds, decorations etc. I had another product from here which was good so I ordered m&p from here to see if it was different from my previous experience. Oh yes !! from here it is wonderful. Not wet through all the time, nice and clear and a pleasure to deal with. I will always order from here from now on. Highly recommend this product. COMMENTS: I use this product for my glycerin soaps and for sugar scrubs (using Debbie May's favorite scrub recipe). It works like a charm. In my soaps, the base is so clear that it really shows off the color and sparkle I add. COMMENTS: Perfect for seeing embeds in your soap. COMMENTS: ... for embeds and pictures. This soap is THE clearest MP base I have ever purchased! COMMENTS: This is my go to clear MP soap base. I make ALOT of soap bars & this one is my first choice, along with the detergent free three butter which is white. But sometimes, you want a clear bar...I add jojoba oil beads, or sink little kids toys in this base & it works great. Minimal cloudiness. Makes really cool colored glycerin bars as well! COMMENTS: Takes color very well and is very clear. Great for imbeds! Will definitely buy again. COMMENTS: First I tried the "Suspend" clear soap base but it was murky looking, not the look I was going for. Then I tried this one, and it was perfect. Very clear, take color and fragrance well, and embeds suspend in it just fine. COMMENTS: Like the clarity of this base. Much better than the plain clear one. COMMENTS: LOVE this base for my specialty soaps...super clear and really shows the artwork beneath...just wished it came in detergent free. COMMENTS: I love using this soap base for children's soaps. 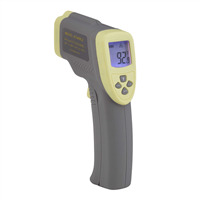 It is so clear, you can embed toys, and the soap lathers and cleans very well. All you have to do is melt the soap, add your fragrance and pour it into your mold. So easy! COMMENTS: This is absolutely my favorite melt and pour base. It not only is a wonderful lathering silky bar, but is so clear and nice. COMMENTS: I love how clear this is. Works great with color and fragrance. COMMENTS: Love this soap for all the embeds and for using the special paper that you sell to embed photos. Great product and lathers very well. COMMENTS: I just love how this soap is crystal clear. I love working with it and seeing the amazing crystal clear soap it produces. • The clarity of it. COMMENTS: I love this. It's very clear and nice on the skin. COMMENTS: This is my absolute favorite of the clears! I've been using them with the liquid stained glass colors and the shimmer and/or sparkle mica powders, and the mica shows through so great! This is the clear base I will ALWAYS get! "Rubber Duckey, you're the one!" COMMENTS: This made bathtime lots of fun with my Rubber Duckey soaps! COMMENTS: This base is great. Even though it is very clear it is not as clear as others here. I also prefer to buy the 24 lb block . COMMENTS: I love using this to make whipped body sugar scrubs. I also love the price. COMMENTS: Love using this for adding designs to tops of my soap loaves. Mix micas with the clear soap base, then drizzle on top of your loaf. Beautiful!! COMMENTS: This will be the only clear soap I buy from now on! A true clear color! Great for embedded soap projects! COMMENTS: Perfection at a great price. Local stores sell lower quality product at a higher price. WPS can not be beat! "The ONLY melt and pour I will use"
COMMENTS: I use melt and pour soap to make cute embeds for my cold process soap. 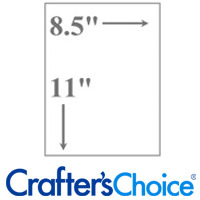 After running out of Crafters Choice and using another brand I purchased locally, I really learned a lesson. All the embeds from the local melt and pour got horrible glycerin dew! It really messed up my design. Not cool. I have never had a single Crafters Choice embed go dewy on me. There's just no comparison. This is the one to buy. COMMENTS: I use this in MP soap and to make layers in CP soap. It's very easy to use and turns out crystal clear. Love it!! COMMENTS: I use it for my embed soap and it's so clear and see through. Will definitely re-order. COMMENTS: This base is so clear. This helps so much when coloring the soap. The lather is nice as well. COMMENTS: I make a lot of glycerin soap for gifts and for craft shows. This product is PERFECT for imbeds and nice clean and clear soap. It holds color and scents extremely well. COMMENTS: This is by far the best clear I have bought. Most look cloudy. As long as you don't over heat, it stays nice and clear. I use this for my fish in a bag, also putting photos (on embed paper) to make custom orders. One of my favorite soaps. COMMENTS: Used it with stained glass red for the reindeer soaps and I love how it looks. COMMENTS: Loove it! It is crystal clear. COMMENTS: I've used other crystal clear bases before, but they were always a little yellow or dingy-looking. This soap is water-clear, and super-easy to work with! "Crystal Clear Soap Base is Superb"
COMMENTS: I ordered this for my 11year old son to make the Gingerbread Snow Globes from this site and they came out fantastic. I sold out within 3 days. The base was perfectly clear on the first through last attempt. No issues no change in color. COMMENTS: This soap is very clear and perfect for my soap embeds! "not clear as stated on package"
COMMENTS: I ordered the signature crystal clear soap base in the two pound tray. While I did like that it was smooth melting and easy to use, I found that it was cloudy not crystal clear. I watched some videos that suggested adding a half drop of blue to make it clear, but I still found it was cloudy. For that reason I have to give it a average rating. Although I would buy it again for the smoothness and ease of use but I wish it was crystal clear like the package says. PS-did not use color or scent in it. "Not quite as clear as hoped "
COMMENTS: This base is nice and smooth, easy to use. It however is not really all that clear. Use less than a drop.... just a smudge of blue liquid color and it creates the optical illusion of crystal clear. With that said, I will buy again. COMMENTS: Got this in a sugar scrub kit and am very satisfied with the final product will definitely be using this again!! COMMENTS: I don"t believe there's a base any where as clear.This makes a beautifull soap because of it.Do watch out as it can sweat sometimes,but well worth the finished product. COMMENTS: I am in love with this M&P !!! Seriously,I had no idea glycerin could be this fantastic.What a huge difference it made.It melts evenly,stays liquid for long periods without skim forming.It is also as it says,so totally crystal clear.I can't believe how this glycerin has completely changed my opinion of glycerin soaps.I am a cp soap maker ,but use melt and pour often for embeds and etc.....this merges perfectly with my cp soap.Seamless and gorgeously integrates.I will never ever use any other melt and pour!!!! !Buying 50 pounds today. If you are a M&P soaper......you must order this,do yourself a huge favor and ditch whatever you currently use! "Clearest Base I have ever used"
COMMENTS: I make quite a lot of children's soaps with embeds. This base is is the very best and my soaps always look fabulous! Kids love them, and so do parents and grandparents. COMMENTS: I used this for the fish in the bag M&P project. Melted well, worked perfectly! I added the TINIEST bit of blue to make it even more crystal-water like clear. Took scent well and easy to work with. COMMENTS: great fun to work with and the product is deep cleansing! COMMENTS: So clear and easy to work with. COMMENTS: Holds on to color great!!!! COMMENTS: That's the best word to describe this product. It is the clearest product I have seen! I live by the ocean and this product has not sweat one drop!! The only downside is that a lot of customers want an SLS free product but if that does not bother you (which it doesn't bother me) then you will be very happy with this. COMMENTS: Out of all the clear soaps I have purchased from various sources, I will say that this is by far the CLEAREST soap I have come across and with virtually no odor. I cannot say enough good about it and, as I type, I am using it in my Watermelon bars. That, combined with the Red Oxide pigment provided me with a fantastic, realistic looking "watermelon". "My go-to clear base! " COMMENTS: Love this clear base! Perfect for embedding erasers, bugs and other little toys. Great for coloring, melts and pours very well. COMMENTS: I used this base for embeds and it worked great. Although I prefer the detergent free soap bases most of the time, this one is my pick for when I need very clear soap. COMMENTS: I love this product. Everything mentioned in the product details is true! COMMENTS: Super clear! Some other M&P bases I have tried have a slightly off color which I guess doesn't matter if you are coloring it but this one is very clear, great quality and customers love it! COMMENTS: I love this base for toys in soaps and any other kind of design where you want the outer layer to be really clear. COMMENTS: I like this MP better than others I have used. It stays nice and clear and doesn't cloud when fragrance is added. It hardens and lathers nicely. COMMENTS: This is the best clear soap! I used it for embedding water soluble paper and the writing is so clear through it that it hardly seems like there is soap over it. CC Response: Thank you for your review! If you spritz the top of your poured soap with rubbing alcohol then this will help to pop the bubbles that form.